Even though summer break is coming to a close, there's still plenty of perfect weather for everyone's favorite summer treat...ice cream. Then again, is there ever a time of year that isn't perfect for ice cream? This shop is one for the books, though. Kids take note- when you follow your passion an amazing future awaits. Just ask Kimmer Elam. Yes, the owner of Kimmer's Ice Cream. 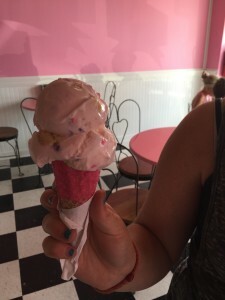 After college, Kimmer decided to follow what she loved best...ice cream...and continued her education at Ice Cream University (seriously, it's a real thing). She opened shop in St. Charles in 2010 and I've been wanting to try it for quite a while, but just hadn't made it. So, my daughter and I jumped at the chance when we happened to be in Wheaton and saw her new, second, location there! Though Kimmer was there serving ice cream and offering a warm welcome to us first-time visitors, I didn't have a chance to chat with her...next time I hope. Regardless, I will definitely be back since it was impossible to decide between the incredible flavors: cinnamon roll, coffee & donuts, peanut butter chocolate truffle. Seriously? How can you choose just one?! But, I was too full from lunch (next post!) so my daughter and I shared a scoop (really, it was more like three) of Fairy Tale Cookie- creamy deliciousness packed with pieces of sugar cookie. Twist our arms, we also splurged a little on Kimmer's glitter cone. Next time I head to Wheaton I'll be smart enough to pack a cooler in the car, I'm bringing home some quarts (Aztec Hot Chocolate please). Maybe a couple of the ice cream cookie sandwiches too. Of course there are sundaes, shakes, and smoothies if your heart desires. My family is already aware that I'm requesting a Kimmer's birthday cake for next April! 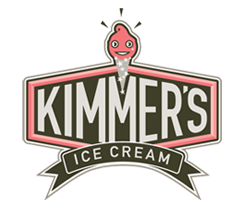 Kimmer's Ice Cream in Wheaton is easy to find- just a few doors down from Starbucks on Front Street- in the old Tate's. Don't be surprised if there's a line out the door, believe me, it's worth the wait. Are you following our Facebook page? "Like" my page for great deals and news from our featured small businesses. Love hearing about the great small businesses that I've found on this challenge? Add your email & you'll be notified every time there's a new post! A treasure that I was not aware of. Good for my soul and mental health, but probably not for my efforts to lose weight. Now, I have to steel myself to avoid more than the Oberweiss shop. Sounds like they have some stiff competition for mango/pomegranate ice cream, or another summer favorite of Key Lime Pie, which has bits of actual flaky pie crust in the tart sweetness. The coffee and donuts flavor sounds like a future comfort food classic. So glad I could introduce you to a new-- soon to be favorite- spot. I'll take good for the soul over bad for waistline any day...that's what long walks are for! Though I am secretly grateful I don't live close enough to make it a daily stop.